Super Autobacs this Saturday. 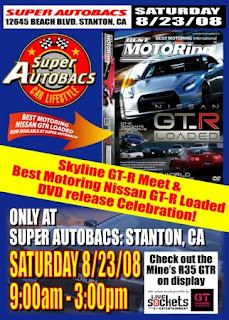 Let me know if any heritage or current GT-R owners want to come by. There is supposed to be an area for GT-R parking to mark the release of this new Best Motoring Video. Its always fun to get a few GT-R's together. Autobacs 12645 Beach Blvd , Stanton, CA. R32, R33, R34, R35 GT-R's. sounds cool. I may not be able to make that. I'll be in near there because I have to go Disneyland with the lady.